A special collection taken at every Catholic parish in Maine along with direct donations, have raised $424,200 to provide emergency and ongoing assistance for the earthquake survivors in Haiti. Bishop Richard Malone directed all parishes in the state to participate in the collection beginning the weekend following the disaster. 100% of the money donated is being forwarded to the Catholic Relief Services (CRS) national office, the official international humanitarian agency of the U.S. Catholic Church. Catholic Relief Services has been working in Haiti for 55 years providing basic needs and overseeing ongoing development projects. It contributes $20 million dollars annually to that country for the food program alone. Since the earthquake, the service has been designated as the lead agency for a large camp in Port au Prince for displaced people and for the town of Leogane (20 miles from Port au Prince). CRS has mobilized emergency staff to set up shelters for the homeless, to distribute food, water purification tablets and mosquito nets, and to provide medical supplies and teams. Diocese for several years. The Christ Episcopal Church in Gardiner recently held a candlelight dessert and music event and raised $2,000 for their village in Haiti. 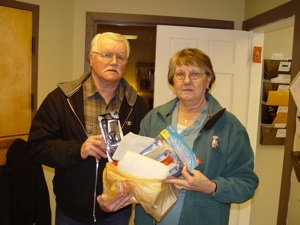 items collected for Haiti by members of the Sanford First Baptist Church. St. Patrick’s Episcopal Church in Brewer held a Celtic Festival on March 6, 2010 to benefit Haiti. followed by Celtic singing and bagpiping. A traditional corned beef and cabbage dinner was served. All proceeds went to the Episcopal Relief Work in Haiti. A special collection taken at every Catholic parish in Maine along with direct donations, have raised $445,221 to provide emergency and ongoing assistance for the earthquake survivors in Haiti. Bishop Richard Malone directed all parishes in the state to participate in the collection beginning the weekend following the disaster. 100% of the money donated is being forwarded to the Catholic Relief Services (CRS) national office, the official international humanitarian agency of the U.S. Catholic Church. The second collection raised $405,431; Catholic Schools contributed another $6372 and $33,418 was sent directly to the Diocese's Missions Office. Several parishes in Maine have a historical connection with the people of Haiti through their support of sister parishes in the island country. 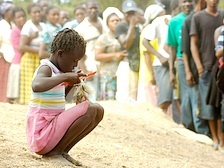 Haiti is recognized as the poorest country in the western hemisphere and one of the poorest in the world. CRS has been working in Haiti for 55 years providing basic needs and overseeing ongoing development projects. It contributes $20 million dollars annually to that country for the food program alone. Since the earthquake, the service has been designated as the lead agency for a large camp in Port au Prince for displaced people and for the town of Leogane (20 miles from Port au Prince). CRS has mobilized emergency staff to set up shelters for the homeless, to distribute food, water purification tablets and mosquito nets, and to provide medical supplies and teams. CRS is funded in part through collections taken by Catholic churches around the world and by individual donations made directly to CRS. The agency works in more than 100 countries worldwide. Monies sent to CRS with the designation for Haiti will be spent exclusively for humanitarian efforts during this time of emergency and for long term relief. Donations to CRS may be made locally at this address: Catholic Relief Services, P.O. Box 11559, Portland, Maine 04104-7559; or to the national office at P.O. Box 17090, Baltimore, Maryland 21203-7090. In the memo portion of the check please designate Haiti Earthquake. CRS has earned an A rating from the American Institute of Philanthropy and meets all 20 standards of the Better Business Bureau. We are just getting started with our Haiti partnership. We do not have a partner yet but hope that in the next couple of weeks we will have an official partnership with an Episcopal Church in Haiti. We are presently raising funds through Cartridges for Kids by recycling ink and toner cartridges, laptops, cell phones, DVD's and CD's as well as Game Boys and Ninetendo games. The money raised will be added to our $2000. that we have committed to this project on a yearly basis. We are also putting together a picture book of our congregation to introduce ourselves to our partner church. I will send you information as we progress. The Westbrook-Warren Congregational Church held a fundraising dinner for Konbit Sante on March 6, 2010. Dr. Sam Broaddus of Konbit Sante, which provides health care in northern Haiti, spoke at the dinner. He is profiled on this Maine Friends of Haiti website. medical personnel, treating people and handing out medicines.